February is the month for all things heart related. Pink and red is scattered about in your nearest drugstore and/or superstore while heart shaped balloons, bears, and candies grab the attention of anyone and every one’s soft spot. For anyone focused on matters of the heart, this month also pays close attention to your ticker (cardiac organ) as February 1 marks the beginning of American Heart Month. That thing central to your being has been under attack for quite some time in the last series of decades as 1 in 4 deaths a year occur due to heart disease. Heart disease and heart-related illnesses affect both women and men and have been found to be THE No. 1 killer worldwide alongside strokes. Although daunting, there are numerous preventative measures that can be taken as well forms of awareness that have been determined to spread that message against the disease. The American Heart Association is a well-known organization that has been dedicated to fighting and saving lives since its beginnings in 1924. Founded by six cardiologists, the AHA has grown into one of the world’s leading as well as largest voluntary organizations focused on cardiovascular health while investing millions into research and the improvement of our overall health. While spreading the word about prevention and the measures taken to avoid or lower the risk of this silent killer, health care providers, communities, and non-profit organizations can continue to stand against such deadly diseases. At the same time, the encouragement and teaching of individuals about their bodies and how to live heart healthy lives will continue to make an impact and hopefully improve our overall health as communities. Awareness ribbons have rapidly become a popular way to bring awareness to specific cancers, diseases, causes, issues, etc. The color "Red" for awareness ribbons not only represents heart disease & stroke, but several other causes including but not limited to the following: the fight against HIV/AIDS, substance abuse, MADD (Mother's Against Drunk Driving), DARE (Drug Abuse Resistance Education), Evans Syndrome, epidermolysis bullosa, complex regional pain syndrome, and vasculitis. Also, Red Ribbon Week® The Red Ribbon Campaign® is another popular campaign recognized in schools cross America; it's the oldest and largest drug prevention program recognized every October. Custom minted at our own SilverTowne Mint in Winchester, Indiana, these .999 pure silver bullion rounds are exclusive to SilverTowne. 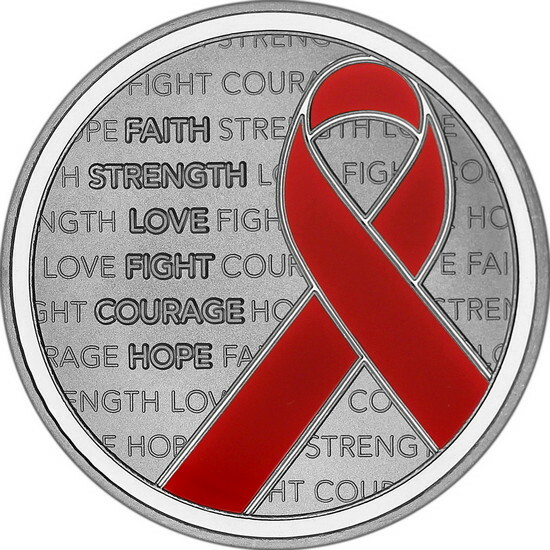 With an individually hand-painted/hand-enameled obverse that features a Red awareness ribbon atop the words "FAITH, STRENGTH, LOVE, FIGHT, COURAGE, AND HOPE" in bold letters; these words alone stand for encouragement and support. The medallion is then topped off with a clear coat to seal in the Red Ribbon color. The reverse features our standard non-dated design with the weight and purity designations of “1 Troy Ounce .999 Fine Silver” encompassing a 'blank' area designated for personalization with optional custom engraving. 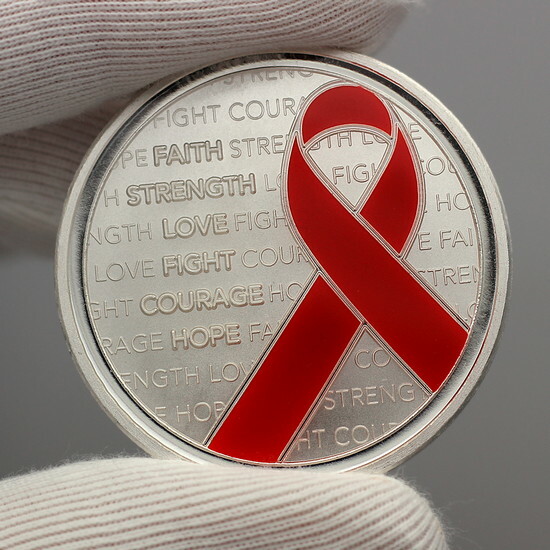 Spreading awareness with the unique gift of silver is truly a once in a lifetime experience. 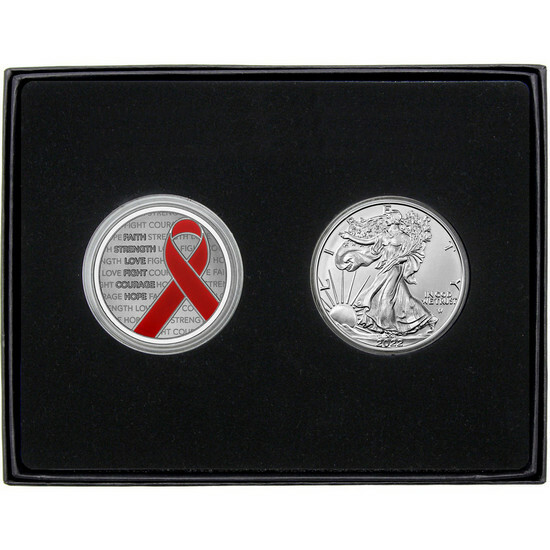 Developed over the past year by an experienced in-house team, this new addition to our special occasion silver is truly something to be proud of from our standpoint and certainly yours as an individual that wishes to celebrate and/or commemorate those you love with such a powerful message of support and hope while spreading awareness. Our custom packaging completes your thoughtful gift; made with recycled materials all in the USA, the natural kraft paper gift box houses a custom foam insert cradles your silver round inside a fitted plastic capsule keeping it safely snug inside. In addition, custom outer sleeves come in a variety of bow colors and have a space for personalized messaging on the back. Gift wrapping is no longer needed, simply choose a bow color or sleeve design to match your cause. While spreading awareness about taking care of your heart and others, a red bow sleeve would match perfectly with your message while completing your gift wrapping needs.